A thruster that moves game objects using the builtin physics engine from Unity. At its core it is a wrapper of rigidBodyToPush.AddForceAtPosition function. You can choose when to add the force (each frame-Update or physics frame-FixedUpdate). 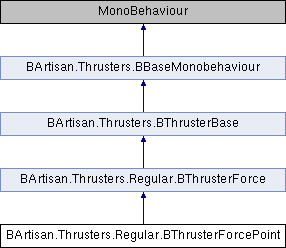 The thruster is built for 3D environments (the force is applied to a Rigidbody). Rigidbody to apply the thruster force. Leave blank for auto detect. Ignoring mass it will use the ForceMode.VelocityChange. See the manual for more info. The amount of force that will be applied to the rigid body. It's multiplied by current throttle and divided to each frame for 1s. Disable this if you want more realistic physics. True - apply force once per Update() or False - apply force every FixedUpdate (0-n times per frame), good for anti gravity.